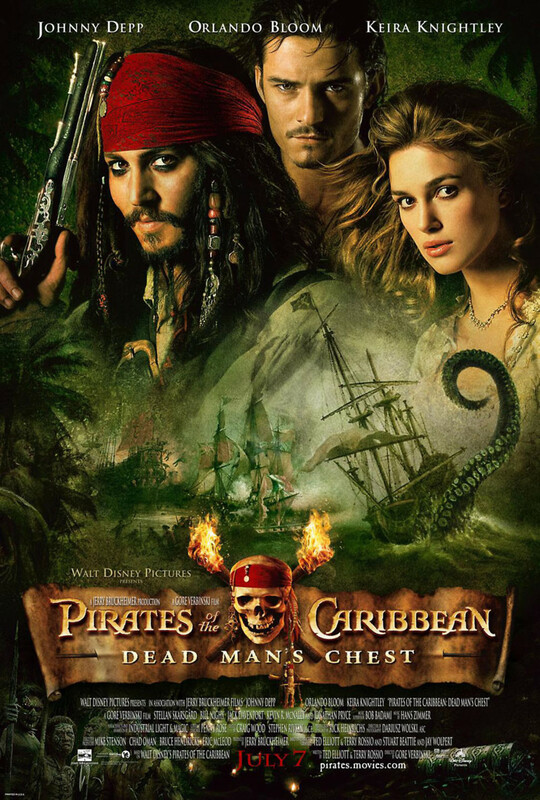 The second film of the Pirates of the Caribbean series, Dead Man's Chest begins with the interrupted wedding of Will Turner (Orlando Bloom) and Elizabeth Swann (Kiera Knightley). Elizabeth finds herself imprisoned for her role in the previous film's climax, and Will's only hope of saving her is by dancing along the strings of her arresting officer, the smarmy Lord Cutler Beckett (Tom Hollander). Beckett wants something from the famous Jack Sparrow (Johnny Depp), something he sends Will to get, but Jack himself has more on his mind than the troubles of his law-abiding friends. Reunited with old buddies (Stellan Skarsgaard) and new flames (Naomie Harris) alike, Jack is forced to confront his past when it rises out of the sea and demands tribute. A long time ago, Jack made a deal with Davy Jones, and now it's time to pay. Neatly following The Curse of the Black Pearl and setting the stage for the epic conclusion At World's End, Dead Man's Chest is a thrilling tale of love, adventure and life on the sea.